Its really hard for me to decide it I like the epoxy boards or the distressed boards the best. They are all just beautiful. 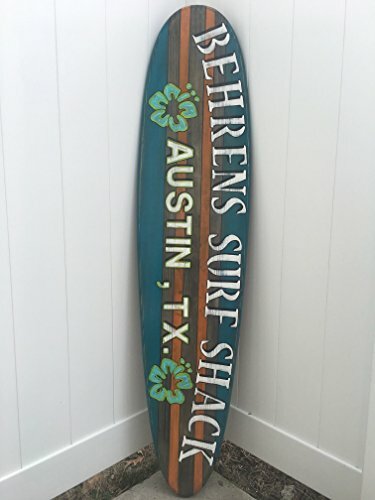 Here's your chance to order a custom personalized five foot surfboard wall hanging. This board will be distressed with a aged look and feel. A light coat of poly will be sprayed to protect the paint. Made of distressed style hardwood. The paint colors are teal with orange stripes. A walnut stain pigment on the wood. Once you place your order, send a message with the text you want on the board. Its that simple. Board measures five feet long x 14 inches wide x 3/4 thick. Wall mounts included. Thank you so much. If you have any questions about this product by Flyone Boardshop, contact us by completing and submitting the form below. If you are looking for a specif part number, please include it with your message.